It's a 3-day weekend starting tonight here in the US...and the Roommate & I are off to NYC. We love going there, but really don't do it enough, partly because there's so much to do here in DC & we love our house & hate leaving Bella. However, we have friends to visit, a new baby to meet, artwork to pick up & exhibits to check out. Although we're quite big MoMA fans, I think this weekend we'll spend most of our time at the Met. Why? Well, for textile fiends like the Roommate & I there are at least 2 exhibits, and really, if you add in our art deco fetish, there's 3. Don't even get me started on the Dűrer exhibit! And another on the Parisian Avant-Garde! We may have to sleep there, just like Claudia & Jamie. 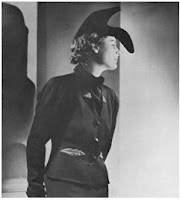 So, the first stop will probably be the Schiaparelli & Prada show, exploring the affinities between the two designers. Check out the link for some great photos of their designs & the rather clear influence one had on the other. Second, we'll head over to see Textile Collectors in Egypt, which I'm sure will be fun, but a bit depressing. Essentially, from 1880 - 1930, people went mad for textiles from the late Roman Empire to the early Islamic period. As bodies were wrapped in several layers of cloth for burial, finding a gravesite could yield many pieces of fabric, which would then be trimmed & chopped up for sale to eager collectors, often without an archeologist present to record details--so knowing the age or background is impossible. A fun weekend, I just wish the Met had a better cafeteria, as it looks like we'll be spending the day there...I much prefer the MoMA's. So my lunch bag is finished! Yay. I can't wait to use it tomorrow. In the meantime, I thought I'd put a few tips online for some things I figured out that I hadn't seen mentioned elsewhere. Oilcloth is not easy to work with. It sort of fights back! I didn't have any trouble getting the slick side to feed through my machine, but apparently some people do & use tissue paper so that the feed dogs can grip the oilcloth. I didn't have to do that, but at some of the bulky points I did have to push & pull to help the machine. my rotary cutter, used to press seams & folds. One thing I did figure out that if you needed a distinct fold sewing a row of stitches makes it a lot easier to fold. Then you need something to "press" the fold over, because you cannot iron oilcloth. The back of a spoon is one recommendation, but I found the handle end of my rotary cutter worked well. I was using Brett's post on Design Sponge, but really struggled with the measuring & getting things to match up. I had to measure & re-measure & cut & re-cut, but I'm quite pleased with the result. And even though no small project ever turns out to be that straightforward for me...I don't think I spent more than 3 hours on the whole thing. I am hoping that I will get better at it, because I really want to make a bunch of Brett's storage boxes to help with organization in my sewing room (and possibly in the kitchen, too). For one thing, I think the little storage bins will be great for patterns. Right now my patterns are mixed in with my fabric in large Ikea boxes, so a separate place to put them would be really useful. Here's the inspiration. I won't even show you my current lunch bag, made from recycled plastic, purchased at Whole Foods with おいしい on the front (which means delicious). But it is so grody now...it just doesn't come clean anymore. I am working away on the Starlet Suit, but it's a long-term project. I like to see things get done so like to have both long & short-term projects going at the same time. I got the fabric at fabric.com. 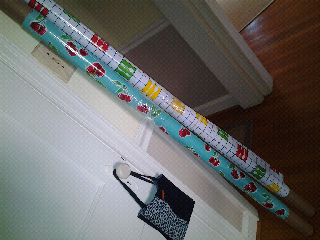 It comes on these huge rolls, in a very long box (which Bella loves). The fabric is quite cute & I'll post more up-close photos as I get the project going. If you need some ideas or further instruction, check out Sewing with Oilcloth. Check out Oilcloth Addict for more ideas & shopping. I do have to say I thought the selection was very good over at Fabric.com, too. As a librarian, I'm not sure whether or not I'm a traitor, but I finally broke down and bought a Samsung tablet! (Many of my colleagues already have them, so I decided to get on the traitor-wagon). Anyway, it's a Galaxy 10.1 & I mostly got it for reading. I've checked out 2 books so far from the library, and also have got my subscriptions to the New Yorker & Economist activated. 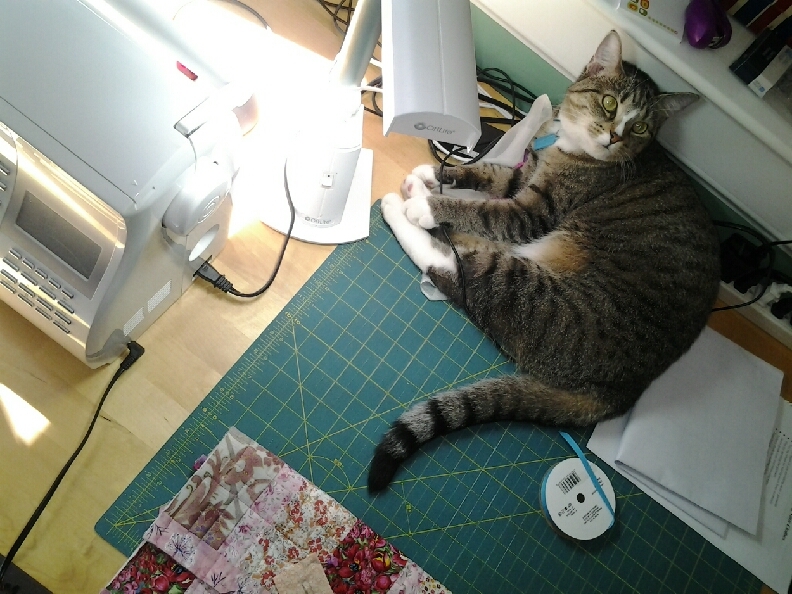 As you well know, Bella loves to supervise, and here she is, right in the middle of things. One look at that luscious raccoon tail & you can see why I don't do any cutting when she's around. I ended up not using any big pieces, really, just scraps from clothing & other projects. The button is vintage, from my grandmother's house. 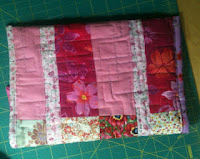 This is the back, nothing special, but I like doing this non-traditional quilting (with my machine! ), overlapping cool 1950s looking boxes, hopefully. Though I'm sure this color combo is not at all appropriate to the 1950s. 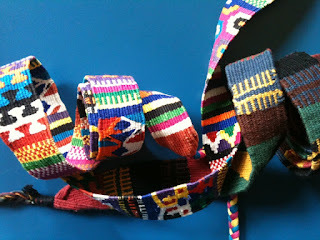 I do love using scraps...I see dresses & quilts I've made which bring back some great memories. Here it is closed, with the very pretty binding fabric showing. And the last picture shows you yet another bound buttonhole! I'm still not an expert, but they are fun, and look soooooo nice. I had to do some handwork on the inside, to sew down the binding of the buttonhole so it would look neat look when I open up the case. 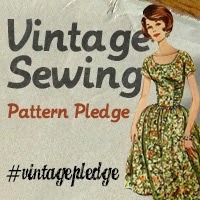 As I've said before, I love vintage patterns, but have had lots of trouble modifying them to fit me (when I can't get hold of the correct size), so I figure that the books and the classes cannot hurt. I think I mentioned that we stuck a bed/bath/closet onto our house after we bought it. We've been slowly decorating it, and a few weekends ago the Roommate put up a curtain rod (about the only way we've come up w/ that gently displays our textile collection) above our bed. And the first thing on it is two of our many treasures from Guatemala. 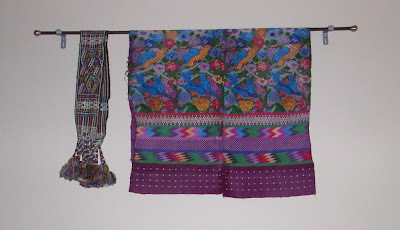 It's a huipile (tunic) from Aguas Calientes. The weaving & embroidery styles for each area of the country are quite distinctive, and it's generally easy to tell where women are from by the lovely tops & skirts they are wearing. The Anthropology Museum in Columbia, Missouri has a nice online exhibit, if you'd like to see more. And here's a photo of a woman from Aguas Calientes, wearing her lovely huipile, and weaving another. The detail is amazing, as you can see from this second photo. 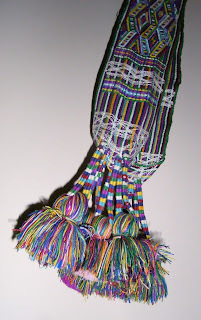 It has many of the typical elements of huipile design (zig zags, bluebirds, flowers, other trimmings), but of course rearranged in a pattern pleasing to the weaver (who most likely is also the wearer). 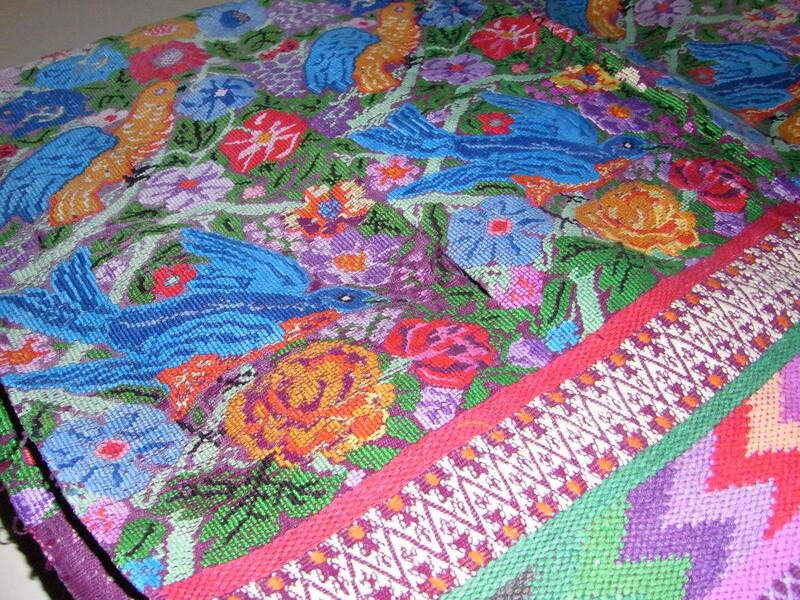 We've had weavers look at it & they say they cannot tell if it was woven or embroidered, the work is so fine. Here are a few other woven bands we got there, also worn braided into the hair by the women of the various regions. Thank you for looking at more of our treasures! You can always ask questions in the comments section, and I will try to answer, if I am able.